While Vidarbha won their maiden title last season, Gujarat were the winners the season before. Ahead of another season, it would be too early to speculate if there will be another first-time winner this year too. 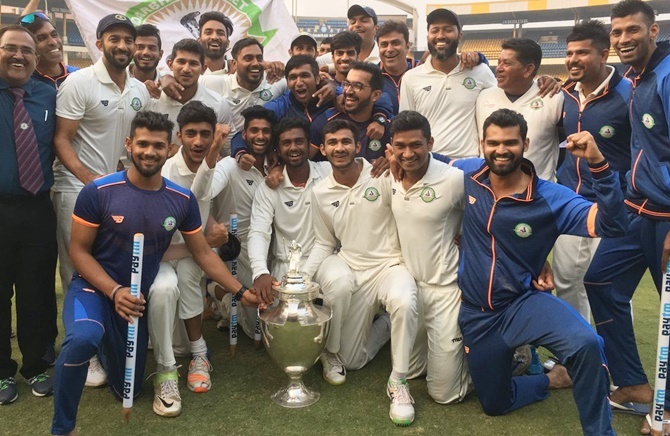 A record 37 teams, including seven debutants from the northeast, participating in the Ranji Trophy beginning on Thursday pose a massive logistical challenge for a cricket board going through administrative chaos. The new teams -- Manipur, Arunachal Pradesh, Mizoram, Uttarakhand, Sikkim, Nagaland, Meghalaya , Bihar and Puducherry -- did feature in the recently held 50-over Vijay Hazare Trophy but playing red-ball cricket will be a tougher challenge. More than 50 grounds will be used during the tournament, making it a huge logistical challenge but Saba Karim, Board of Control for Cricket in India's GM of Cricket Operations, said his team is ready. "We are ready and we have proved that with the successful conduct of domestic tournaments (Vijay Hazare, Duleep Trophy and Deodhar Trophy) leading up to the Ranji Trophy. Our team has been working round the clock ahead of the tournament," Karim said. "The new teams have shown what they are capable of. No doubt, Ranji Trophy will be their toughest challenge but with the help of outstation players, I am eager to see how they perform," added the former India wicketkeeper. While the nine teams aim to find their footing, domestic stars will be in action across Group A, B and C. Test regular Cheteshwar Pujara is expected to play Saurashtra's opener against Chattisgarh while spinner Ravichandran Ashwin and Murali Vijay have been named in the Tamil Nadu squad for their first game against Madhya Pradesh. With teams already announced for the four-Test series in Australia and the India 'A' tour of New Zealand, exemplary performances in Ranji Trophy are unlikely to be rewarded. Group A seems to be the toughest of all in the presence record champions Mumbai, Karnataka, Maharashtra, Saurashtra, Railways Chattisgarh, Vidarbha and Gujarat. While Vidarbha won their maiden title last season, Gujarat were the winners the season before. Ahead of another season, it would be too early to speculate if there will be a first-time winner of Ranji Trophy. Teenage star Prithvi Shaw will not feature against Railways as he still recovering from an injury he suffered during the Deodhar Trophy in Delhi last week. Most of the Test regulars are expected to play in early stages of the tournament, unless they are picked for the India 'A' tour of New Zealand, which takes place ahead of the Test series in Australia beginning December.